On October 5, 2017, the City Council of St. Petersburg, Florida passed (by a 6-2 vote) a groundbreaking ordinance to abolish super PACs and limit spending by foreign-influenced corporations in city elections. The ordinance, the first of its kind in the nation, establishes limits on contributions to “independent-expenditure only” political action committees, known as super PACs, effectively abolishing super PACs in St. Petersburg elections. It also requires corporations that spend $5,000 or more on St. Petersburg elections to certify they are not owned or controlled in significant part by foreign entities. 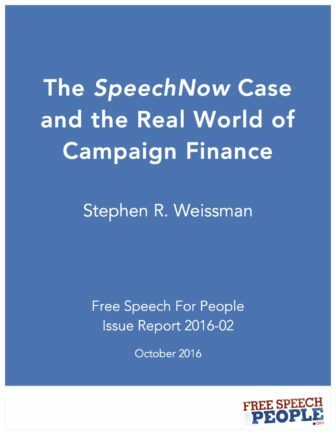 We launched this campaign in 2016, building off of momentum from our filing of the FEC complaint to end super PACs, and it could create another test case to challenge big money in our elections. On July 21, 2016, City Councilwoman Darden Rice of St. Petersburg introduced our proposed ordinance before the St. Petersburg City Council to abolish super PACs and limit spending by foreign-influenced corporations in city elections. A “Committee of the Whole” meeting took place on Thursday, October 27, 2016 with testimony and written letters of support presented to the City Council. The final vote passing the ordinance (6-2) happened on Thursday, October 5, 2017, and the law took effect January 1, 2018. Special thanks to Karen Lieberman, the Lead Organizer of the Coalition for Campaign Finance Reform in St. Pete and a leader of American Promise-Tampa Bay; Julie Kessel, the President of the League of Women Voters of the St. Petersburg Area; Rae Claire Johnson, a leader of American Promise-Tampa Bay; City Council Member Darden Rice, the lead sponsor of this ordinance, and the courageous city councilmembers who voted with her to pass this ordinance; and the hundreds of citizens across St. Pete who stood up to defend our democracy and to help enact this model law. Check out this inspiring short video about the journey to victory. Since the Supreme Court’s 2010 Citizens United decision invalidated restrictions on corporate political spending, considerable public and policymaker interest has developed in the potential for U.S. elections to be influenced by foreign interests through U.S. corporations. On the one hand, existing federal law (the Federal Election Campaign Act) already prohibits political spending in federal, state, or local elections by corporations that are incorporated outside the U.S., or which have their principal place of business abroad. On the other hand, current law still allows substantial avenues for foreign influence over corporate political spending by U.S.-incorporated and -based corporations. Lawmakers in Congress and members of the Federal Election Commission have expressed interest in addressing this phenomenon. As of yet, federal reform proposals have failed to advance. A more likely near-term prospect for new policy measures is at the state and local level. Local governments (notably in St. Petersburg, Florida) are now contemplating measures to address this concern. This paper focuses on ownership of significant blocks of stock as a potential mechanism for foreign influence over corporate political spending. 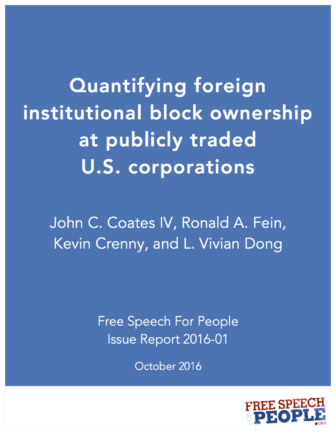 We found that roughly one in eleven (9%) companies in the S&P 500 has one or more foreign institutions each owning five percent or more blocks of stock, nine have foreign institutions with ten percent or more blocks, five have a foreign institution with more than fifteen percent, and three have foreign institutions with more than 20% blocks. Three firms have multiple foreign institutional blockholders. This is the first recent empirical analysis of the level of foreign institutional blockholder ownership of publicly traded corporations. In the U.S. Court of Appeals for the D.C. Circuit’s SpeechNow decision, which created super PACs, the court theorized that contributions to so-called “independent expenditure committees” could not possibly result in corruption. In the real political world, however, as this study shows, top donors to super PACs and other independent spenders are not only contributing to these groups. They are simultaneously giving directly to the very candidates who benefit from their contributions to independent spending. The typical two-track donor supports multiple candidates in this fashion. Thus, while independent spending groups are legally restrained from coordinating with their beneficiaries, donors to such groups are legally permitted to financially coordinate with these same candidates within certain contribution limits. When donors amplify their legally limited direct contributions to candidates with unlimited indirect support via independent spending groups, an “anti-corruption interest in limiting contributions to an independent expenditure group” certainly arises. These unlimited contributions intensify the dangers of quid pro quo corruption and its appearance that contribution limits were established to prevent.